Premise: Two contestants will compete in a series of two trivia rounds against the Pawn Stars cast. In the first round, the contestants will answer multiple choice, toss-up questions against Corey Harrison and Austin “Chumlee” Russell for a chance to win one of the items (valued around $1,500 in the first round) from Rick’s person collection in the Gold & Silver Pawn Shop. Each question is worth $100 with no penalties for incorrect answers. 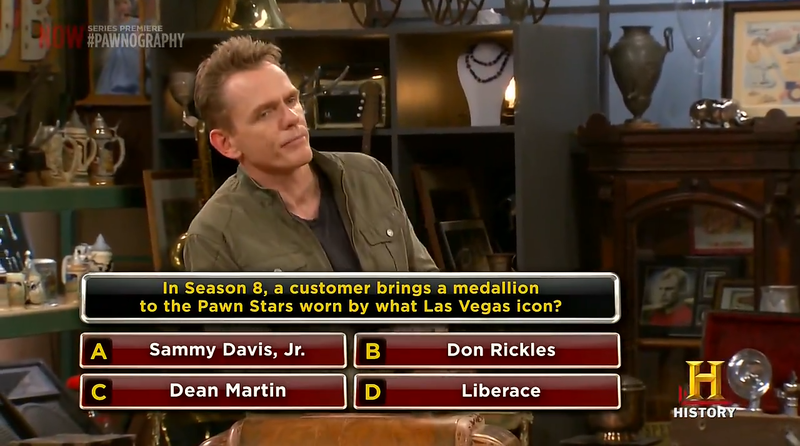 A video bonus question, pertaining to one of the episodes of Pawn Stars, will be asked at the end of the first round, only to the contestants, and is worth $150. The contestant with the most money at the end of the round wins the item. If the Pawn Stars win the round, they keep the item. 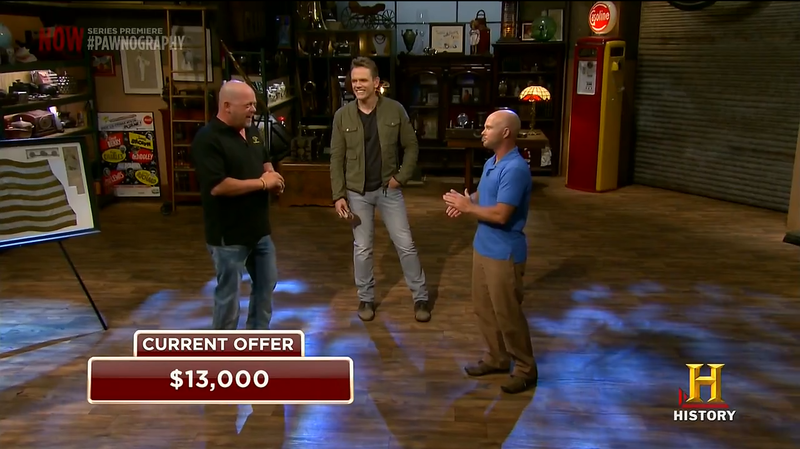 In the second round, the rules are the same with the exceptions of the video question, the questions are worth $200, the item at stake for the round is valued around $5,000 and the contestants now face Rick Harrison. The contestant with the most money at the end of the game will advance to the bonus round while the other contestant leaves with nothing. 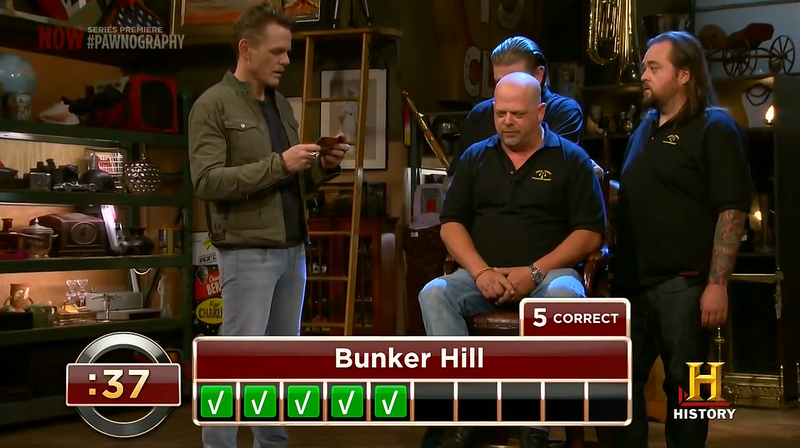 In the third and final round, the winning contestant now faces all three Pawn Stars in a “best-of-ten” trivia round for a chance to add an item, worth around $9,000, to their winnings. The contestant takes his/her turn first will the Pawn Stars are sent backstage to a soundproof booth. The contestant has 60 seconds to answer as many questions correctly as possible. After time expires, the Pawn Stars and contestant swap places and the Pawn Stars will have 60 seconds to answer the same questions. Before the results are revealed, Rick will make a final cash offer to the contestant in lieu of the all the items and cash he/she won in the front game plus the item at stake in the end game. Additionally, the contestant is allowed to negotiating the offer. If the contestant chooses the cash offer, he/she only wins the cash, despite whether or not he/she actually beat the Pawn Stars in the final. If the contestant beat the Pawn Stars, he/she will win the items and cash in the main game, the item offered in the final round. Otherwise, the contestant wins nothing. Pawnography is a decent game show for HISTORY to capitalize on the current success of the popular Pawn Stars series. This show is like a mixture between Pawn Stars and Win Ben Stein’s Money with a pinch of ITV’s The Exit List. The Win Ben Stein’s Money element is shown through the Pawn Stars actively playing against the contestants to protect their items, the “Best of 10” bonus round and the use of the electronic eggcrate readouts. On a quick side note, it’s refreshing to see a show utilize old technology like the rarely seen eggcrate display, considering The Price Is Right is perhaps the lone game show that uses the archaic scoring equipment assisted by operable incandescent light bulbs. The show’s unique resemblance to the 2012 ITV game show The Exit List is shown through Rick making the contestant a final offer before the results are unveiled toward the end of the final round. Besides the fact that it’s a Pawn Stars spinoff, one of the selling points of the series is its simplicity within the gameplay and the set. The basic, thematic set design retains elements one would see in an antique pawnshop, or even in a man’s garage, attic or “man” cave, such as the array of vintage items that line the walls of the set, the plastic marquee letters used for name plates, a wooden bar table used for the contestants’ podium and an old-fashioned floor cabinet radio used for the host’s podium. It meets a happy medium between not looking too simple and unassuming, like Make The Grade, and not appearing too busy and crowded. The relaxed atmosphere works for this show and complements the contestants’ and casts’ casual attire as well as the set design. As far as the format is concerned, Pawnography is nothing more than a straightforward trivia contest with the twists placed in the proper areas where needed. This game is a good test of quickness, knowledge, confidence and intuition, especially when you have to compete against Rick’s impressive wide range of general knowledge trivia. The producers created the gameplay well enough without developing it in a cheesy manner, like Peter Tomarken’s “favorite” game show, Bargain Hunters, did. The rounds properly increase in difficulty from easy (competing against Chumlee and Corey) to medium (facing Rick) to hard (going toe-to-toe-to-toe against all three against the clock as well), and this is not even counting the difficulty of the questions. There is a healthy distribution of easy and medium-leveled difficulty within the question sets, although the variety within the subjects is lacking. Judging by the two episodes I have seen, I had noticed that most of the questions are majorly centered around American history. Other commendable elements include the great show flow, which slightly resembles Jeopardy’s quick-fire trivia pace, the excellent editing that makes the show more fluid and less choppy and obvious that edits were made, the applaudable prize payouts and comedian/actor Christopher Titus as the host. The prize budget is good for a 30-minute cable game show like Pawnography, considering a contestant could win over $15,000 in cash and prizes on a good day. As host, I like the producer’s decision of selecting Christopher Titus to take the helm. His relaxed, comfortable and good-humored demeanor complements the show’s atmosphere perfectly along with his excellent ability to carry the show well. As per usual with most of my reviews, there are few areas where the show could be improved including making a few tweaks to the main game. Some of the changes include better integrating the Pawn Stars aspect within the game itself and categorizing each round’s set of question based on the item up for grabs. One of the appeals to watching a show like trading reality show like Pawn Stars is the viewer discovering how valuable certain rare items are worth. This aspect can be easily fused into the format by creating a final main game round where an unbiased expert showcases an collectible item and the contestants and Pawn Stars would have to guess its actual value (similar to It’s Worth What?) for $500 to give the trailing contestant one last shot of making a comeback. Also, instead of random trivia, the questions in each round could have a central theme based on the item offered in the round (e.g. : pinball machine = arcade game trivia). Overall, Pawnography may not be any History IQ, but it’s good enough. It’s the type of game show where it will be over before you know it and is enjoyable to watch because of its simplicity and the fact that it’s not embellished with annoying, unwarranted gimmicks. Pawnography definitely gives its contestants a run for their money and vice versa in regards to the Rick, Corey and Chumlee. It won’t be a ratings powerhouse, but it certainly shows the potential to become one of the channel’s more popular shows and I predict it will be sticking around for another season. In fact, the show’s two-episode series premiere debuted as the number one new series of 2014 thus far by averaging an impressive 2.82 million viewers (2.905 at 10pm and 2.745 at 10:30pm). The new game show also ranked #9 and #10 among the top 49 network and cable primetime ad-sustained programs last Thursday night. Even if you have never seen an episode of Pawn Stars, you will enjoy watching Pawnography. Check out new episodes of Pawnography Thursday nights at 10:00pm on HISTORY! Next Post Quick Review of "The Singer Takes It All"
An impressive and watchable game show – surprising it is coming out the Pawn Stars dynasty – a couple otha shows come out of that bin of characters (counting cars – american restorations) but this one is the best of them all as I've watched 6 episodes and they get better and don't seem too contrived. Neat spin on what they do with the items you see on TV – as many people don't know – those items you see haggled on TV actually are not property of the Shop – but of the production company and they have a warehouse of the stuff – which now they are turning into this crafty TV game show. No joke! But good idea hollyweird. Dec 18 show: Question “Who was 1st American President born in the 19th Century”. Rick answered Ronald Reagan. The game board showed this was incorrect, stating that John F Kennedy was born first. Pawnography was in error., JFK was born like 1917, Reagan was born 1911. With this error, Rick and the contestant was in a tie. Ended that the contestant agreed to Rick's offer, could have been a contested award.